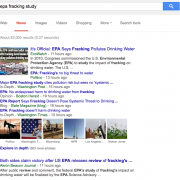 UPDATED – Dec. 2, 2016: Documents obtained by journalists at Marketplace and APM Reports found that officials made eleventh-hour edits to downplay the risks of fracking. Earlier this year the EPA Science Advisory Board also criticized these top-level conclusions and called on the EPA substantiate their claims or consider revising the report. 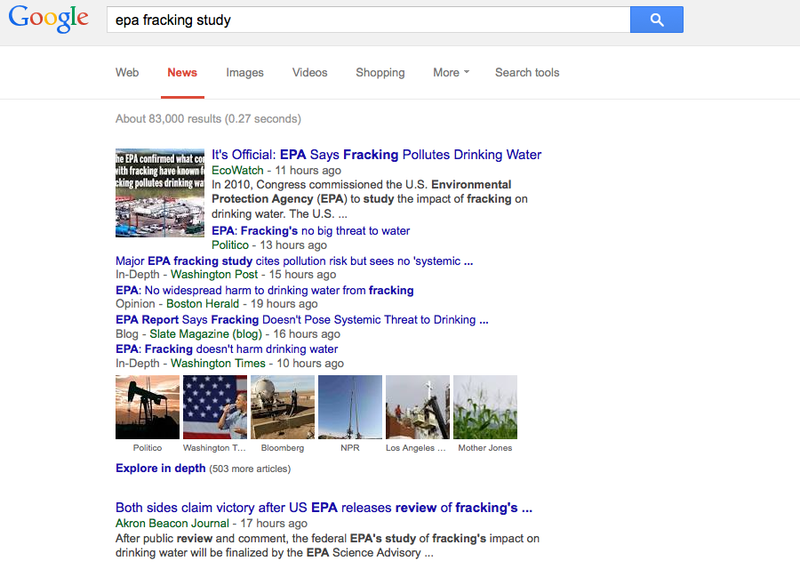 Also, replaced broken link to EPA press release. what the EPA had actually concluded. As Forbes pointed out, the headlines were a bit contradictory. We did not find evidence that these mechanisms have led to widespread, systemic impacts on drinking water resources in the United States. These two statements may look similar, but there is a big difference between saying that you did not find find any evidence of a crime and definitely claiming that you have proven the suspect’s innocence. But try telling the House Natural Resources Committee that fracking has never been proven NOT to cause contamination, and members of Congress will laugh aloud and joke about pigs not flying to Mars. Seriously (check out 1:12:10). This assessment used available data and literature to examine the potential impacts of hydraulic fracturing from oil and gas on drinking water resources nationally. As part of this effort, we identified data limitations and uncertainties associated with current information on hydraulic fracturing and its potential to affect drinking water resources. In particular, data limitations preclude a determination of the frequency of impacts with any certainty. So in short, the EPA didn’t find proof of wide-spread contamination from fracking, but they lack the data to say with any certainly whether that means anything at all. At least they acknowledged that they found “specific instances where one or more mechanisms led to impacts on drinking water resources, including contamination of drinking water wells.” Which is actually big news coming from an agency which had previously stopped short of such a conclusion. https://skytruth.org/wp-content/uploads/2015/06/Screen-Shot-2015-06-05-at-10.44.16-AM.png 640 900 David Manthos /wp-content/uploads/2016/08/test_logo.png David Manthos2015-06-06 02:24:002019-02-06 10:49:42Word Games Continue: Just What Evidence Did EPA Not Find? No, not the hairy cryptid with large feet and reclusive temperament, but rather Chevron’s massive extended tension-leg platform (TLP) in the Gulf of Mexico which was expected to go into production later this year and produce up to 75,000 barrels of oil per day. The massive project hit a setback late last month when 6 of the 16 “tendons” designed to anchor the platform to the sea floor sank in approximately 5,200 feet of water. The Bigfoot platform is reportedly being towed to more secure waters while this incident is investigated. We took a look at satellite AIS and does appear the rig has returned slightly shallower water. Not exactly sure why they took such a long trip down south around May 11, but we do know they have been contending with a strong Gulf Loop Current this year, which also delayed operations. AIS data copyright – exactEarth/ShipView. While a buoyant hull supports the platform’s topsides, an intricate mooring system keeps the TLP in place. 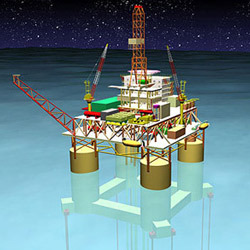 The buoyancy of the facility’s hull offsets the weight of the platform, requiring clusters of tight tendons, or tension legs, to secure the structure to the foundation on the seabed. The foundation is then kept stationary by piles driven into the seabed. The tension leg mooring system allows for horizontal movement with wave disturbances, but does not permit vertical, or bobbing, movement, which makes TLPs a popular choice for stability, such as in the hurricane-prone Gulf of Mexico. If that is a little too technical, check out this promo video from a company that does these installations. In particular, fast-forward to 3:48 and you can see how the tendons have “tendon support buoys” to keep them afloat until they are attached to the structure and the platform is cranked down into the water to hold it in place. The fact that something went wrong with the flotation of multiple tendons before the platform was even put into production is a reminder that things can always go wrong, and when it comes to deepwater oil drilling, the stakes are very, very high. Chevron has admitted that this setback will make it impossible to reach their goal of starting production by the end of 2015. Meanwhile, Shell’s Polar Pioneer remains in Seattle, Washington, gearing up for a summer attempt at drilling in the Arctic despite the protests of ‘kayaktavists’ blockading the massive offshore rig. We would like to think that industry would have to prove they can drill for oil without incident in the relatively placid waters of the Gulf of Mexico before they forge ahead into new territory like the Atlantic Outer Continental Shelf and the harsh but pristine waters of the Arctic Ocean, but in the absence of such policies SkyTruth will just have to continue keeping a close eye on the Gulf, Arctic, Eastern Seaboard, and all the other places being considered or opened up for offshore exploration and production.